TORONTO (July 29) — It is merely a whisper at this point and has a number of moving parts. But, a source tells me the Toronto Maple Leafs, interminably looking for a big–time defenseman, and the St. Louis Blues, in need of offense, have recently kicked trade tires. Whether the tires are flat and meant for a bicycle — or the fully–inflated Hummer issues — remains to be seen. But, the notion is that Kyle Dubas would like to somehow maneuver Colton Parayko out of St. Louis. And, credit to the young general manager for trying. Such a transaction would seem implausible, given that Parayko is only 25 years of age and under contract to the Blues (at $5.5 million) for the next four seasons. Except for a reliable starting goaltender, can there be a more–valued commodity in the National Hockey League than a young blue–liner with considerable upside? It’s a fair question, but must also be weighed against St. Louis missing the playoffs last season for the first time since 2010–11, and only the fifth time in the past 40 years. The Blues have plummeted from third overall in the NHL standings to 18th in the span of two seasons. And, largely, one would assume, as the result of a feeble attack. Only three Western Conference rivals — Chicago, Vancouver and Arizona — scored fewer than St. Louis’s 236 goals. The West leader, by comparison, was Winnipeg, with 277 goals; same number as Toronto in the East. The Jets and Maple Leafs finished with 114 and 105 points, respectively. As such, the Blues and Leafs discussing a trade of defense for offense makes complete sense, as each club would be dealing from a position of strength. St. Louis has Alex Pietrangelo anchoring the blue line, with Parayko, Jay Bouwmeester, Carl Gunnarsson, Joel Edmundson and young Vince Dunn providing reams of depth. Up front, Brayden Schenn led the Blues with 70 points, good for 35th in the NHL. Vladamir Tarasenko fell from 39 to 33 goals and from 75 to 66 points. Contributing to the Blues’ scoring deficiency was that Robby Fabbri missed the entire 2017–18 schedule. Fabbri’s left knee, however, has twice been surgically repaired and no one is clear as to how it may respond. Additionally, the Blues no longer have Paul Stastny. The Leafs, conversely, are loaded up front with John Tavares, Auston Matthews, Mitch Marner, William Nylander, Nazem Kadri and Patrick Marleau. Toronto would not make Nylander available to St. Louis; that sort of outlay requires a Norris Trophy–type return (such as the readily–available Erik Karlsson). Parayko, though just entering his prime years and a coveted right–handed shot, has a mere 35 points in each of the past two seasons. Morgan Rielly and Jake Gardiner each had 52 points for Toronto in 2017–18. But, Parayko is a horse at 6–foot–6 and 230 pounds. The Leafs have nothing close to him in size and potential. He would considerably upgrade the Toronto blue line and, almost surely, improve his scoring numbers in conjunction with the prolific Leaf forwards. 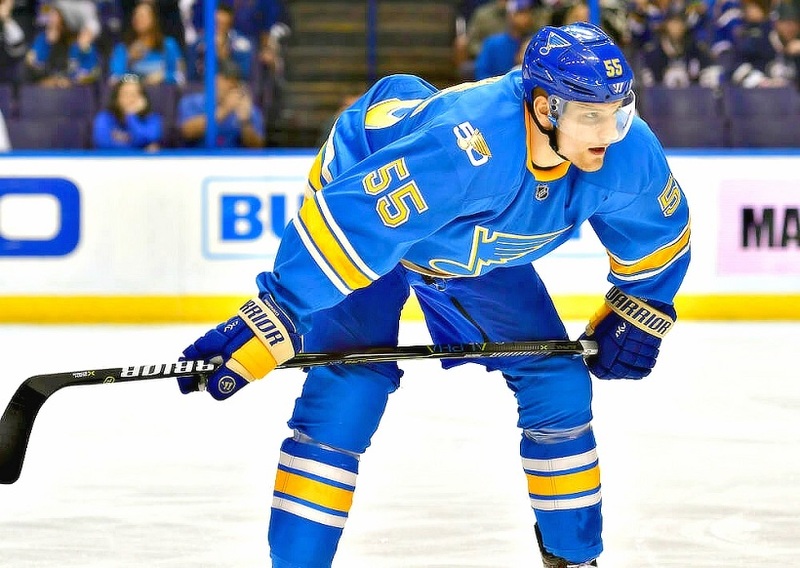 So, what would it take to pry Parayko from Blues’ GM Doug Armstrong? If Armstrong is content to stand pat, it’s a moot question. Should he be willing to sacrifice depth for offense (and, why not? ), the Maple Leafs could entice him with a package that includes Gardiner and Andreas Johnsson. Gardiner, 28, is an unrestricted free agent after next season and has been negotiating a contract extension with the Leafs. Though erratic defensively, he’s an elite skater and puck–handler. Playing alongside poised veterans Pietrangelo and Bouwmeester could do wonders for his career. Johnsson appears to have NHL scoring potential at left wing. Only 23 years of age, he tallied 26 times for the American Hockey League Toronto Marlies last season; and then cranked it up in the playoffs with 24 points in 16 games for the Calder Cup champion. He and Gardiner would add creativity and production to the impoverished Blues. Undoubtedly, this is the type of deal both teams should be exploring. So, how well do you know your Leafs history? And, how it has changed in the past two years? WON THE STANLEY CUP: May 2, 1967 in Game 6 against Montreal at Maple Leaf Gardens. LOST THE STANLEY CUP FINAL: Apr. 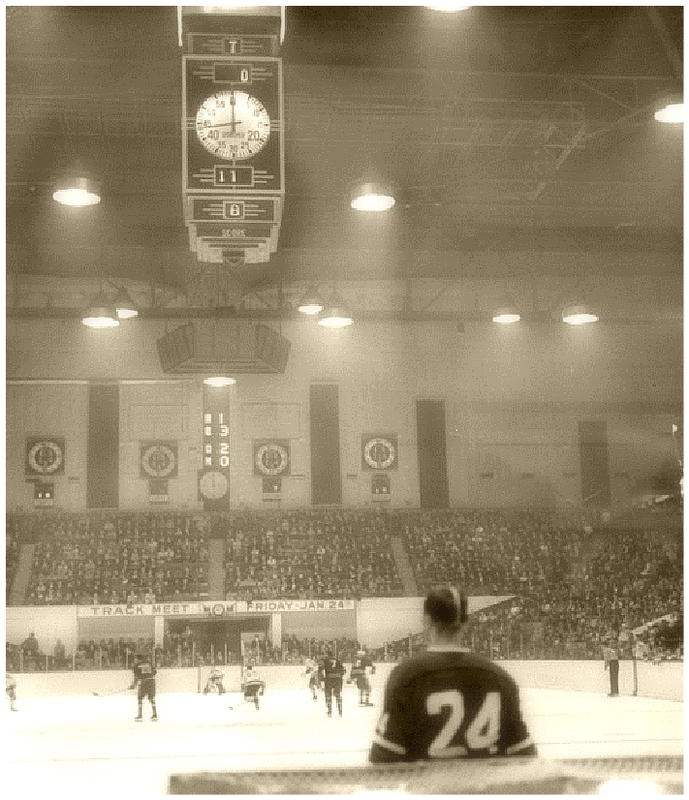 14, 1960 in Game 4 to Montreal at Maple Leaf Gardens. APPEARED IN A PLAYOFF GAME: May 13, 2013 at Boston, losing Game 7 of an Eastern Conference quarterfinal in overtime (Patrice Bergeron beat James Reimer). UPDATE: Apr. 25, 2018 at Boston, losing 7–4 in Game 7 of an Eastern Conference quarterfinal. WON A PLAYOFF GAME: May 12, 2013 over Boston at Air Canada Centre in Game 6. UPDATE: Apr. 23, 2018 at Boston, winning 3–1 in Game 6 of an Eastern Conference quarterfinal. WON A PLAYOFF SERIES: Apr. 20, 2004, over Ottawa at Air Canada Centre in Game 7 of an Eastern Conference quarterfinal. WON A PLAYOFF GAME IN OVERTIME: Apr. 21, 2003, over Philadelphia at Air Canada Centre in Game 6 of an Eastern Conference quarterfinal (Travis Green beat Robert Esche). UPDATE: Apr. 17, 2017, over Washington at Air Canada Centre in Game 4 of an Eastern Conference quarterfinal (Tyler Bozak beat Braden Holtby). WON A PLAYOFF SERIES WITH AN OVERTIME GOAL: May 17, 1999, at Pittsburgh in Game 6 of an Eastern Conference semifinal (Garry Valk beat Tom Barrasso). LOST A PLAYOFF SERIES WITH AN OVERTIME GOAL: May 4, 2004, vs. Philadelphia at Air Canada Centre in Game 6 of an Eastern Conference semifinal (Jeremy Roenick beat Ed Belfour). UPDATE: Apr. 23, 2017, vs. Washington at Air Canada Centre in Game 6 of an Eastern Conference quarterfinal (Marcus Johansson beat Frederik Andersen). RECORDED A PLAYOFF SHUT–OUT: Apr. 16, 2004, over Ottawa at Air Canada Centre in Game 5 of an Eastern Conference quarterfinal (Ed Belfour). SHUT OUT IN A PLAYOFF GAME: May 23, 2002, by Carolina at Air Canada Centre in Game 4 of an Eastern Conference final (Arturs Irbe). SCORED 10 OR MORE GOALS IN A PLAYOFF GAME: Never. ALLOWED 10 OR MORE GOALS IN A PLAYOFF GAME: Apr. 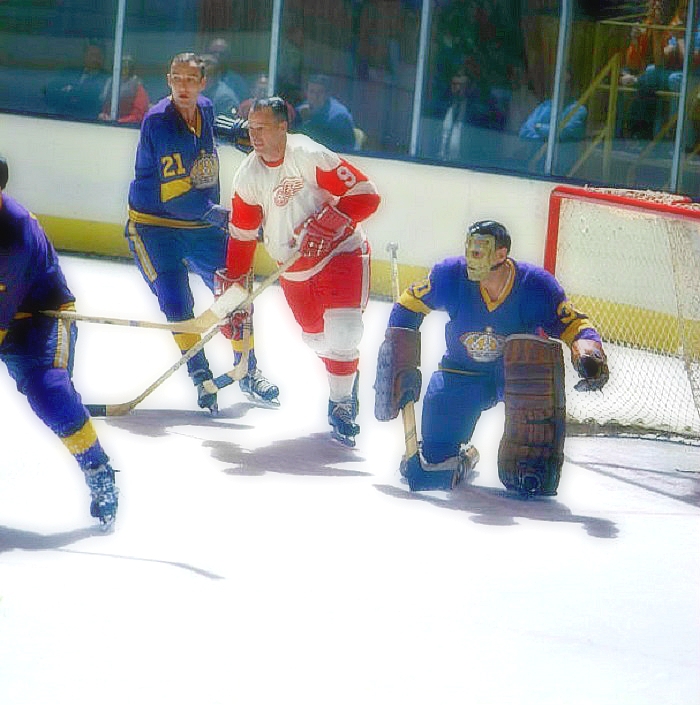 2, 1969, at Boston in Game 1 of a Stanley Cup quarterfinal (10–0 loss). SCORED NINE GOALS IN A PLAYOFF GAME: Apr. 14, 1942, against Detroit at Maple Leaf Gardens in Game 5 of the Stanley Cup final (9–3 win). ALLOWED NINE GOALS IN A PLAYOFF GAME: Apr. 8, 1981, at New York Islanders in Game 1 of a best–of–five preliminary round (9–2 loss). SCORED EIGHT GOALS IN A PLAYOFF GAME: May 8, 1994, at San Jose in Game 4 of a Western Conference semifinal (8–3 win). SCORED ON A PLAYOFF PENALTY SHOT: May 29, 1999, at Buffalo in Game 4 of an Eastern Conference final (Mats Sundin beat Dominik Hasek). SCORED UPON BY A PLAYOFF PENALTY SHOT: Apr. 24, 2002, at New York Islanders in Game 4 of an Eastern Conference quarterfinal (Shawn Bates beat Curtis Joseph). RECORDED A PLAYOFF HATTRICK: Apr. 9, 2003, at Philadelphia in Game 1 of an Eastern Conference quarterfinal (Alexander Mogilny). WON A 1–0 PLAYOFF GAME IN OVERTIME: Apr. 13, 2001, at Ottawa in Game 1 of an Eastern Conference quarterfinal (Mats Sundin beat Patrick Lalime). LOST A 1–0 PLAYOFF GAME IN OVERTIME: Apr. 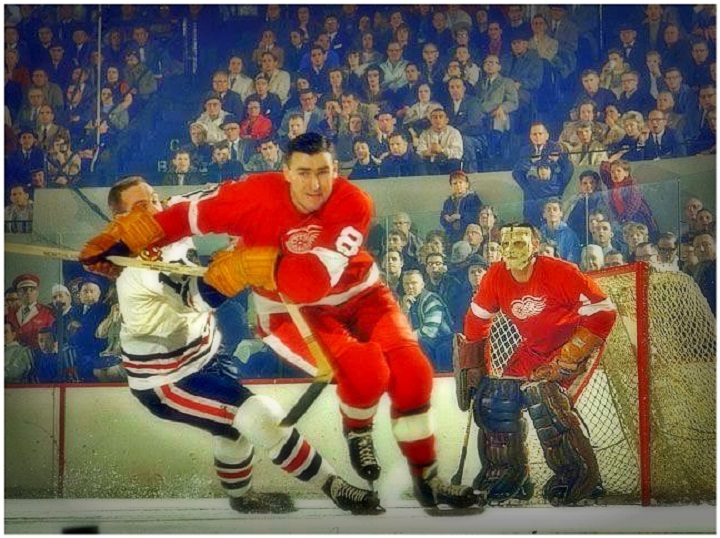 9, 1950, at Detroit in Game 7 of the Stanley Cup semifinals (Leo Reise beat Turk Broda). SWEPT A BEST–OF–SEVEN SERIES: vs. Ottawa in 2001 Eastern Conference quarterfinal. GOT SWEPT IN A BEST–OF–SEVEN SERIES: vs. Montreal in 1979 Stanley Cup quarterfinal. WON THE STANLEY CUP IN OVERTIME: Apr. 21, 1951, vs. Montreal at Maple Leaf Gardens in Game 5 (Bill Barilko beat Gerry McNeil). LOST THE STANLEY CUP IN OVERTIME: Apr. 13, 1940, vs. New York Rangers at Maple Leaf Gardens in Game 6 (Bryan Hextall beat Turk Broda). WON A PLAYOFF SERIES AGAINST A FORMER TEAM: 1979, vs. Atlanta Flames, sweeping a best–of–three preliminary round. LOST A PLAYOFF SERIES AGAINST A FORMER TEAM: 1983, vs. Minnesota North Stars, 3–1 in games of a best–of–five preliminary round. PLAYED 84 GAMES: 1993–94 (2 neutral–site). LOST 50 GAMES: 1984–85 (20–52–8). WON 40 GAMES: 2006–07 (40–31–11). LOST 40 GAMES: 2015–16 (29–42–11). WON FEWER THAN 30 GAMES: 2015–16 (29–42–11). LOST FEWER THAN 30 GAMES: 2003–04 (45–24–10). SCORED 300 GOALS: 1989–90 (337). ALLOWED 300 GOALS: 1990–91 (318). WON SIX CONSECUTIVE GAMES: Dec. 6–16, 2014 (4–0–2). UPDATE: Nov. 6–18, 2017 (6–0–0). LOST SIX CONSECUTIVE GAMES: Feb. 27–Mar. 7, 2016 (0–5–1). WON SIX CONSECUTIVE IN REGULATION TIME: Nov. 27–Dec. 6, 2003. LOST SIX CONSECUTIVE IN REGULATION TIME: Mar. 14–26, 2015. WON ON OPENING NIGHT: 2013–14 (Oct. 1) at Montreal (4–3). UPDATE: 2017–18 (Oct. 4) at Winnipeg (7–2). LOST ON OPENING NIGHT: 2015–16 (Oct. 7) vs. Montreal at Air Canada Centre (3–1). UPDATE: 2016–17 (Oct. 12) at Ottawa (5–4 OT). RECORDED AN OPENING–NIGHT SHUTOUT: 2011–12 (Oct. 6) vs. Montreal at Air Canada Centre (2–0). GOT SHUT OUT ON OPENING NIGHT: 2003–04 (Oct. 11) by Montreal at Air Canada Centre (4–0). WON IN OVERTIME ON OPENING NIGHT: Never. LOST IN OVERTIME ON OPENING NIGHT: 2009–10 (Oct. 1) vs. Montreal at Air Canada Centre (4–3). UPDATE: 2016–17 (Oct. 12) at Ottawa (5–4). WON IN A SHOOTOUT ON OPENING NIGHT: 2013–14 (Oct. 5) vs. Ottawa at Air Canada Centre (5–4). LOST IN A SHOOTOUT ON OPENING NIGHT: 2005–06 (Oct. 5) vs. Ottawa at Air Canada Centre (4–3). PLAYED TEAM OTHER THAN OTTAWA OR MONTREAL ON OPENING NIGHT: 2008–09 (Oct. 9) at Detroit (won 3–2). UPDATE: 2017–18 (Oct. 4) at Winnipeg ( won 7–2). PLAYED TEAM OTHER THAN OTTAWA OR MONTREAL IN HOME OPENER: 1999–2000 (Oct. 4) vs. Boston at Air Canada Centre (won 4–0). UPDATE: 2017–18 (Oct. 7) vs. New York Rangers at Air Canada Centre (won 8–5). SCORED 14 GOALS IN A GAME: Mar. 16, 1957 vs. New York Rangers at Maple Leaf Gardens (won 14–1). ALLOWED 14 GOALS IN A GAME: Mar. 19, 1981 at Buffalo (lost 14–4). SCORED 13 GOALS IN A GAME: Jan. 2, 1971 vs. Detroit at Maple Leaf Gardens (won 13–0). SCORED AT LEAST 10 GOALS IN A GAME: Jan. 4, 2007 at Boston (won 10–4). ALLOWED AT LEAST 10 GOALS IN A GAME: Dec. 26, 1991 at Pittsburgh (lost 12–1). SCORED 10 GOALS ON OPENING NIGHT: 1978–79 (Oct. 14) vs. New York Islanders at Maple Leaf Gardens (won 10–7). ALLOWED 10 GOALS ON OPENING NIGHT: Never. SCORED NINE GOALS IN A GAME: Jan. 7, 2011 at Atlanta (won 9–3). ALLOWED NINE GOALS IN A GAME: Nov. 18, 2014 vs. Nashville at Air Canada Centre (lost 9–2). WON A GAME ON NEW YEAR’S EVE: Dec. 31, 2014 at Boston (4–3 SO). LOST A GAME ON NEW YEAR’S EVE: Dec. 31, 2011 at Winnipeg (3–2). UPDATE: Dec. 31, 2017 at Las Vegas (6–3). WON A GAME ON JAN. 1: 2014 at Detroit (Bridgestone Winter Classic at Ann Arbor, Mich. — 3–2 SO). UPDATE: 2017 vs. Detroit (Heritage Classic at BMO Field — 5–4 OT). LOST A GAME ON JAN. 1: 2009 vs. Buffalo at Air Canada Centre (4–1). WON A LEAP–YEAR NIGHT GAME: (Feb. 29): 2000 at Atlanta (4–0). LOST A LEAP–YEAR NIGHT GAME: (Feb. 29): 2016 vs. Tampa Bay at Air Canada Centre (2–1). 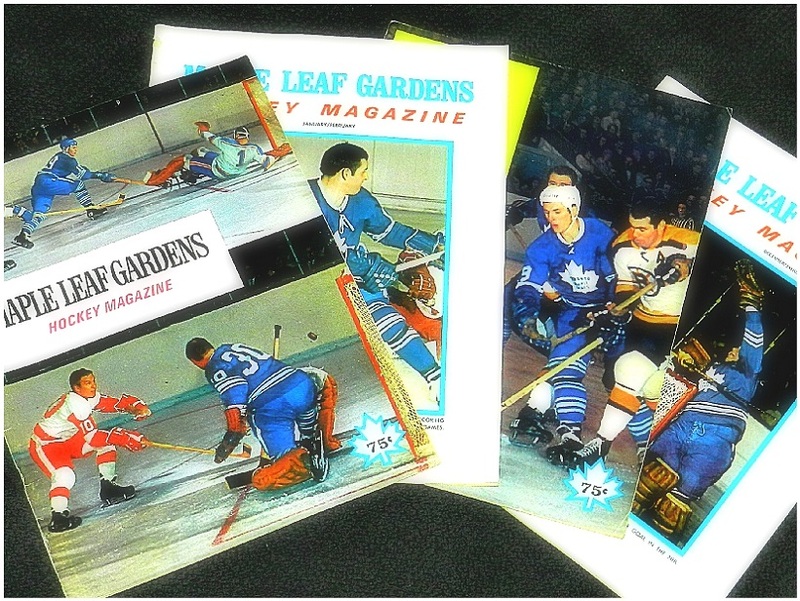 WON A GAME ON CHRISTMAS EVE: 1969 vs. Los Angeles at Maple Leaf Gardens (8–1). LOST A GAME ON CHRISTMAS EVE: 1972 at Chicago (5–1). WON A GAME ON CHRISTMAS DAY: 1971 vs. Detroit at Maple Leaf Gardens (5–1). LOST A GAME ON CHRISTMAS DAY: 1970 at Minnesota (6–3). WON ON APRIL FOOL’S DAY: Apr. 1, 2014 vs. Calgary at Air Canada Centre (5–1). UPDATE: Apr. 1, 2017 at Detroit (5–4). LOST ON APRIL FOOL’S DAY: Apr. 1, 2015 at Buffalo (4–3). RECORDED A SHUTOUT TO END THE SEASON: 2003–04 (Apr. 3) at Ottawa (6–0). WERE SHUT OUT TO END THE SEASON: 2013–14 (Apr. 12) vs. Ottawa at Air Canada Centre (1–0). RECORDED CONSECUTIVE SHUTOUTS: Feb. 1 & 4, 2012 — 1–0 vs. Pittsburgh at Air Canada Centre / 5–0 at Ottawa. UPDATE: Jan. 31 & Feb. 1, 2018 — 5–0 vs. New York Islanders at Air Canada Centre / 4–0 at New York Rangers. WERE SHUT OUT CONSECUTIVELY: Feb. 28 & Mar. 1, 2015 — 4–0 at Montreal and Washington. 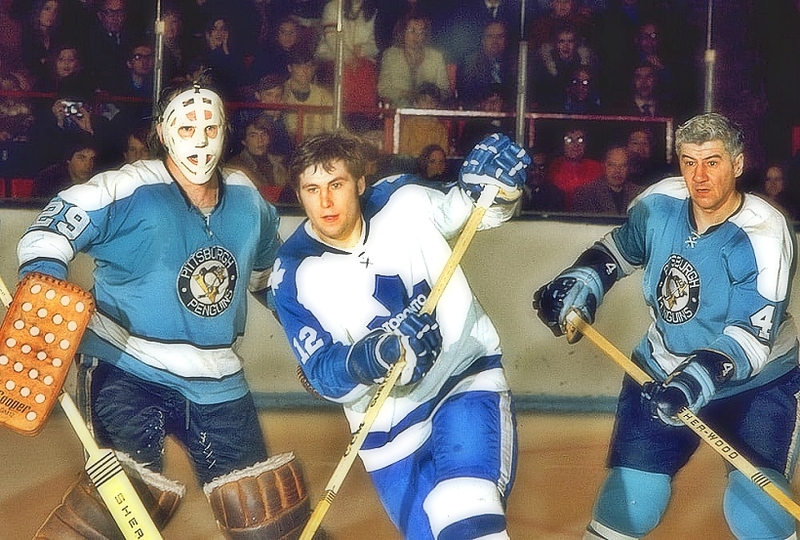 PITTSBURGH at TORONTO — 1970–71: LEAFS CENTER JIM HARRISON (NOW 71) CUTS BETWEEN PENGUINS GOALIE AL SMITH (d. Aug. 7, 2002) AND DEFENSEMAN BOB BLACKBURN (d. Oct. 20, 2016). 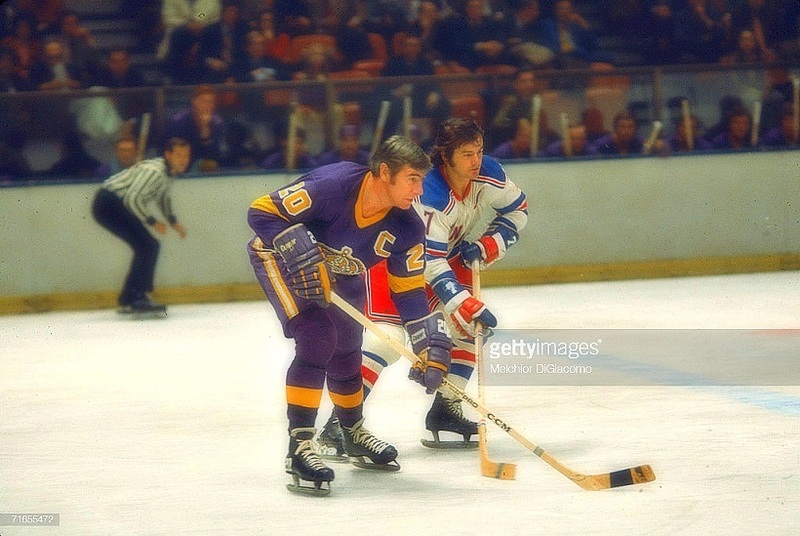 LOS ANGELES at NEW YORK — 1970–71: FORMER LEAFS CENTER BOB PULFORD (NOW 82) OF THE KINGS AND RANGERS WINGER ROD GILBERT (NOW 77) AT MADISON SQUAE GARDEN. 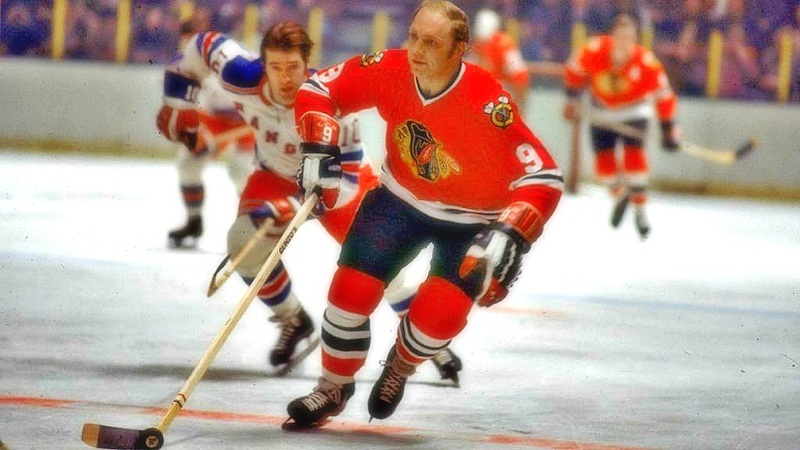 CHICAGO at NEW YORK — 1971–72: BLACK HAWKS LEGEND BOBBY HULL (NOW 79) IS CHASED BY RANGERS FORWARD BILL FAIRBAIRN (NOW 71) AT THE GARDEN. IN HULL’S FINAL CHICAGO SEASON. 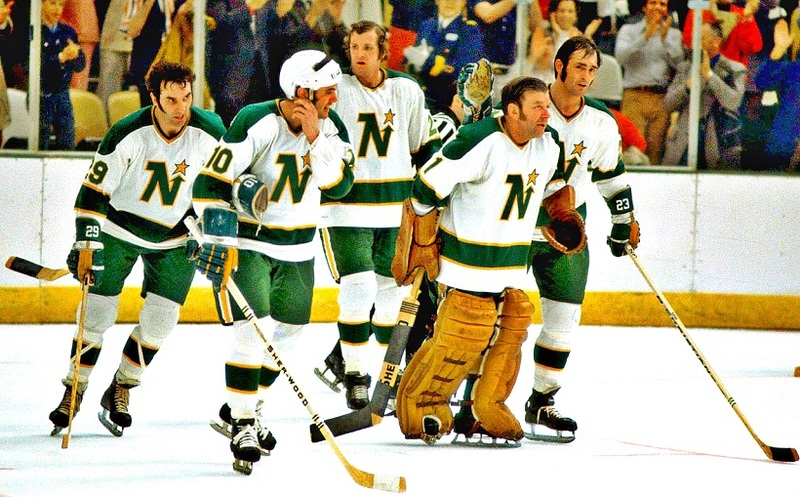 1972–73 — MINNESOTA NORTH STARS SKATE OFF THE ICE AT THE MET CENTER AFTER A WIN. LEFT–TO–RIGHT: DEAN PRENTICE (NOW 85); MURRAY OLIVER (d. NOV. 23, 2014); TOM REID (NOW 72); GUMP WORSLEY (d. Jan. 26, 2007) AND LOU NANNE (NOW 77). NO. 17 FOR THE BALANCE OF HIS CAREER (WITH DETROIT, TORONTO AND BUFFALO). (d. Jan. 10, 2017), AS TERRY SAWCHUK (d. May 31, 1970) LOOKS ON BETWEEN THE PIPES. 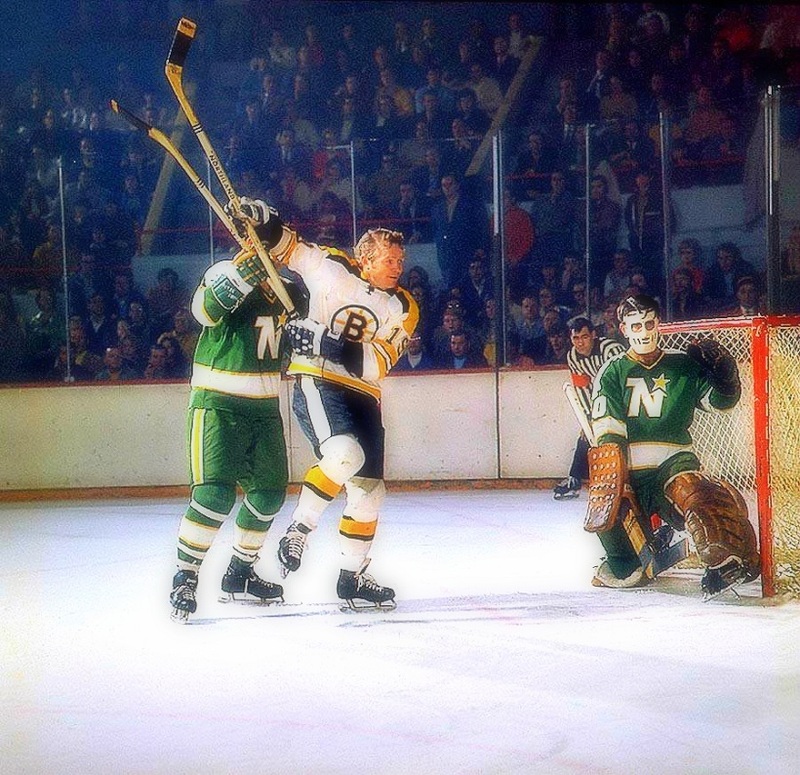 MINNESOTA at BOSTON — 1971–72: BRUINS FORWARD JOHNNY (PIE) McKENZIE (d. June 9, 2018) BATTLES IN FRONT OF NORTH STARS GOALIE CESARE MANIAGO (NOW 79) AT THE BOSTON GARDEN. 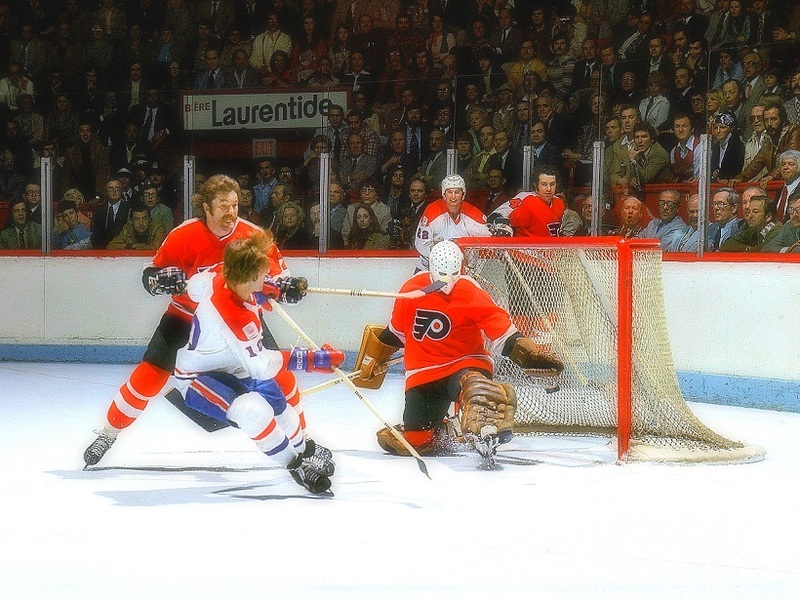 PHILADELPHIA at MONTREAL — 1975–76: HABS LEGEND GUY LAFLEUR (NOW 66) IS CROSSCHECKED BY FLYERS DEFENSEMAN BOB DAILEY (d. Sep. 7, 2016) AS HE SCORES ON BERNIE PARENT (NOW 73) DURING HE 1976 STANLEY CUP FINAL AT THE MONTREAL FORUM. SKATING BEHIND THE NET ARE MONTREAL’S STEVE SHUTT (NOW 66) AND PHILADELPHIA’S JOE WATSON (NOW 75). 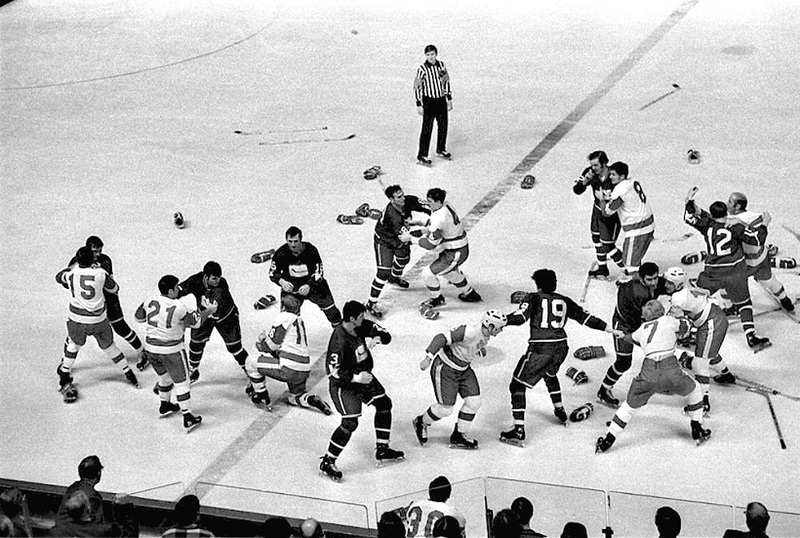 VANCOUVER at DETROIT — 1970–71: A BENCH–EMPTYING BRAWL ENSUES AT THE DETROIT OLYMPIA DURING THE CANUCKS FIRST NHL SEASON. AMONG THE VANCOUVER PLAYERS ARE PAT QUINN (No. 3 — d. Nov. 24, 2014); DALE TALLON (No. 19 — NOW 67) AND MIKE CORRIGAN (No. 12 — NOW 72). DETROIT PLAYERS INCLUDE AL KARLANDER (No. 15 — NOW 71); BILLY DEA (No. 21 — NOW 85); RON HARRIS (No. 16 — NOW 76); ARNIE BROWN (No. 4 — NOW 76); TOM WEBSTER (No. 8 — NOW 69) AND GARRY UNGER (No. 7 — NOW 70). 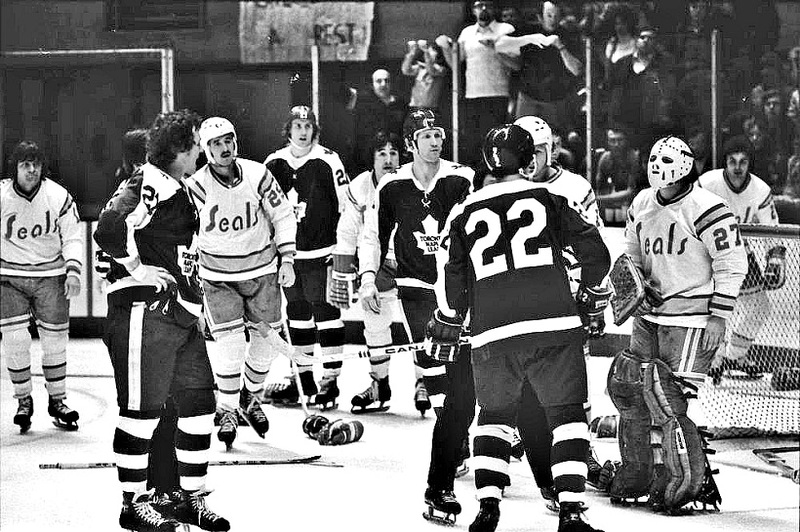 TORONTO at CALIFORNIA — 1974–75: THE LEAFS AND SEALS BATTLE IN OAKLAND. TORONTO PLAYERS (LEFT–TO–RIGHT) ARE DARRYL SITTLER (NOW 67); BORJE SALMING (NOW 67); DAVE DUNN (NOW 69) AND DAVE (TIGER) WILLIAMS (NOW 64). AMONG THE SEALS ARE AL MacADAM (No. 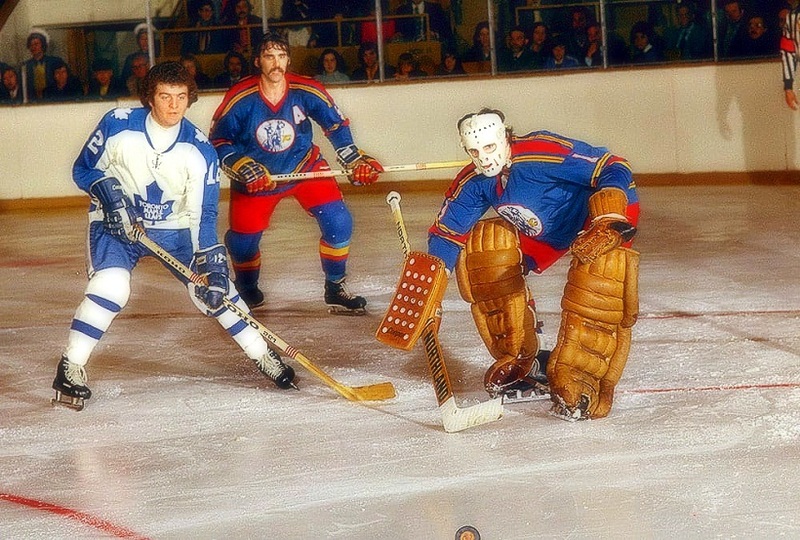 25 — NOW 66); JIM NEILSON (NOW 76, OVER DUNN’S RIGHT SHOULDER) AND GOALIE GILLES MELOCHE (NOW 68). 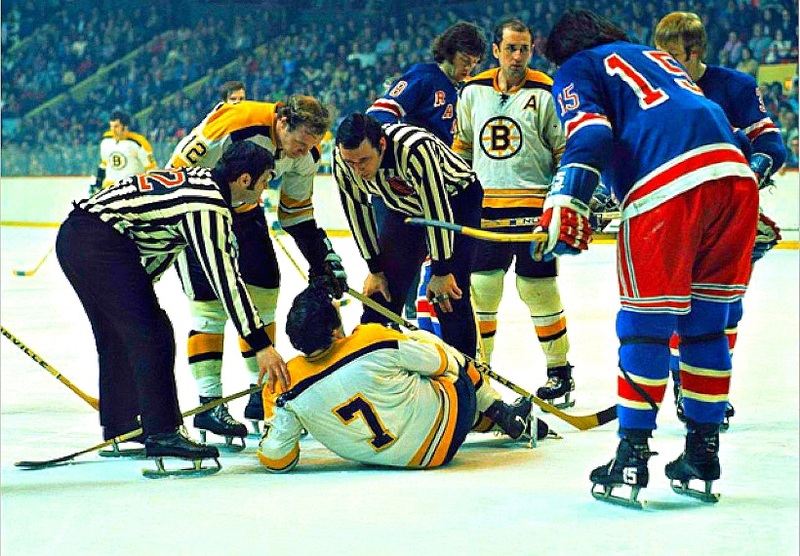 NEW YORK at BOSTON — 1972–73: BRUINS STAR PHIL ESPOSITO (NOW 76) LIES ON THE ICE AT THE BOSTON GARDEN. STANDING ABOVE ARE LINESMEN CLAUDE BECHARD (d. July 5, 2007) AND LEON STICKLE (NOW 70). BOSTON TEAMMATES ARE WAYNE CASHMAN (No. 12 — NOW 73) AND DALLAS SMITH (NOW 76); RANGERS’ STEVE VICKERS (No. 8 — NOW 67); JIM NEILSON (No. 15) AND RON HARRIS. 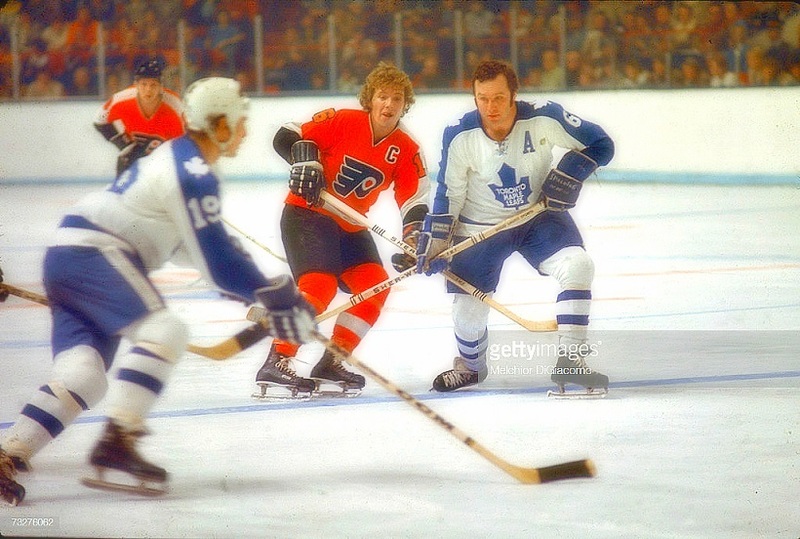 PHILADELPHIA at TORONTO — 1973–74: FLYERS CAPTAIN BOBBY CLARKE (NOW 68) AND LEAFS VETERAN RON ELLIS (NOW 73) LOOK ON AS PAUL HENDERSON (NOW 75) CARRIES THE PUCK AT MAPLE LEAF GARDENS. COINCIDENTALLY, CLARKE, HENDERSON AND ELLIS COMPRISED THE MOST RELIABLE FORWARD UNIT FOR THE LEGENDARY TEAM CANADA IN THE 1972 SUMMIT SERIES WITH RUSSIA. IN THE BACKGROUND IS FLYERS DEFENSEMAN ANDRE (MOOSE) DUPONT (NOW 69). 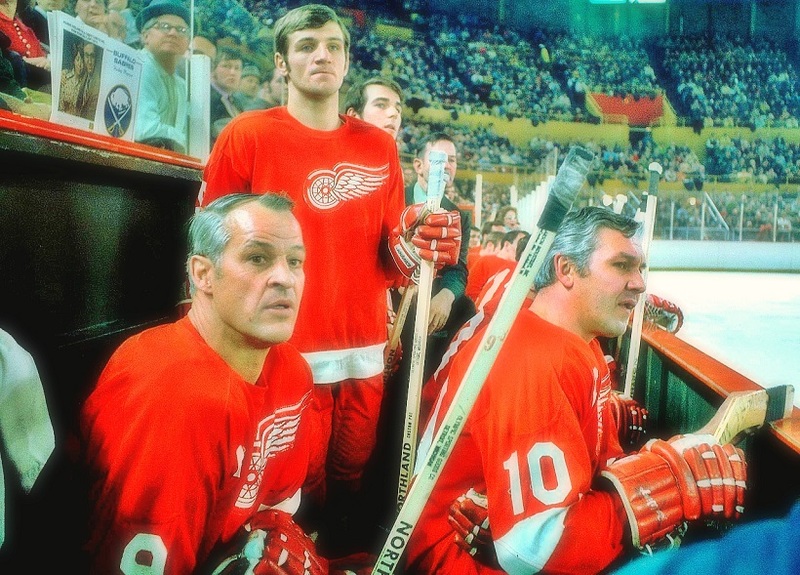 DETROIT at BUFFALO — 1970–71: IN HIS 25th AND FINAL SEASON WITH THE RED WINGS, GORDIE HOWE (d. June 10, 2016) WATCHES ACTION FROM THE VISITORS’ BENCH AT MEMORIAL AUDITORIUM. IT WS THE SABRES’ FIRST NHL SEASON. IN FRONT OF HOWE IS LINEMATE ALEX DELVECCHIO (NOW 86). STANDING, IS WINGER RENE LeCLERC (NOW 70). ANGELES FORUM, WHICH OPENED FOR HOCKEY ON DEC. 30, 1967. 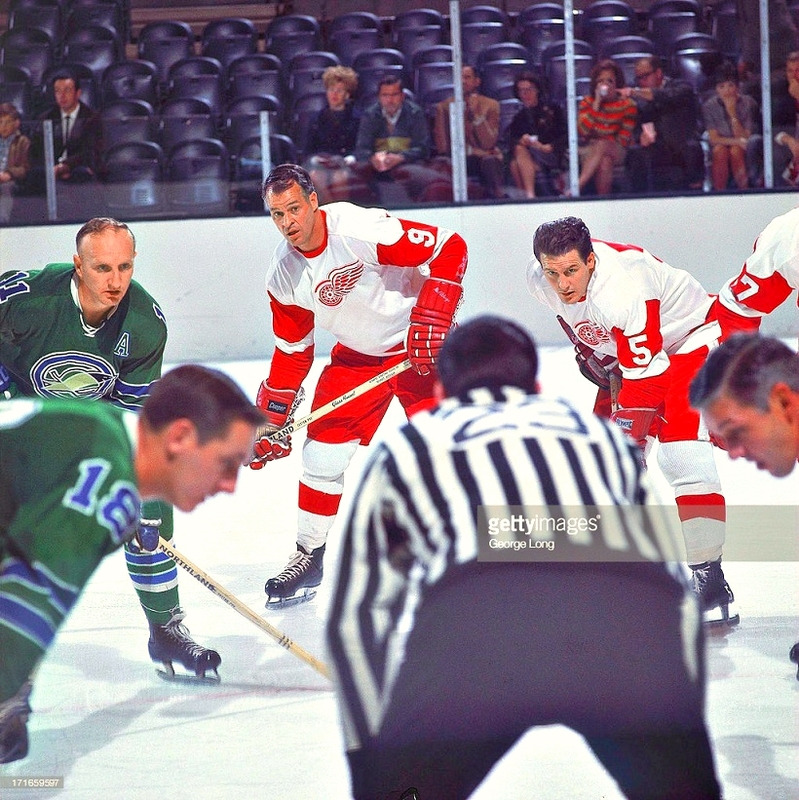 DETROIT at OAKLAND — 1968–69: FROM NOV. 13, 1968, AT THE OAKLAND COLISEUM–ARENA (TICKETS WERE APPARENTLY AVAILABLE), GORDIE HOWE READIES FOR A FACE–OFF NEXT TO TEAMMATE KENT DOUGLAS (d. Apr. 12, 2009). OPPOSITE HOWE IS THE SEALS’ GERRY ODROWSKI (NOW 79). OAKLAND’S JOE SZURA (d. Oct. 13, 2006) LEANS IN FOR THE DRAW AGAINST ALEX DELVECCHIO. 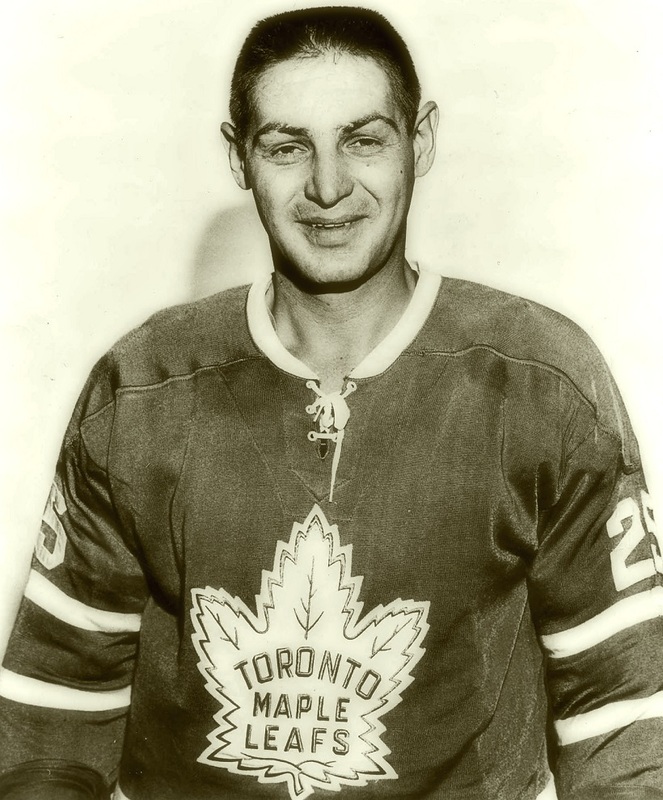 OCTOBER 1964: PUBLICITY PHOTO OF VETERAN GOALIE TERRY SAWCHUK AFTER THE TORONTO MAPLE LEAFS ACQUIRED HIM FROM DETROIT IN THE INTRA–LEAGUE WAIVER DRAFT. 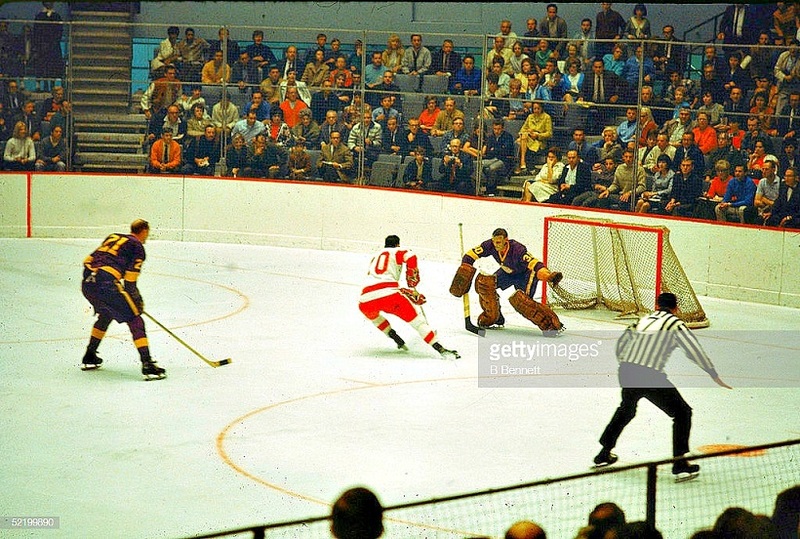 DETROIT at LOS ANGELES — 1967–68: ON NOV. 17, 1967, AT THE LOS ANGELES SPORTS ARENA (CHAIN–LINK SCREEN BEHIND NET), DEAN PRENTICE BREAKS IN ALONE ON KINGS GOALIE TERRY SAWCHUK; DEFENCEMAN BILL WHITE (21) TRAILING THE PLAY. IN THEIR INAUGURAL SEASON, THE KINGS SPLIT THEIR EARLY HOME GAMES BETWEEN THE SPORTS ARENA AND LONG BEACH ARENA. 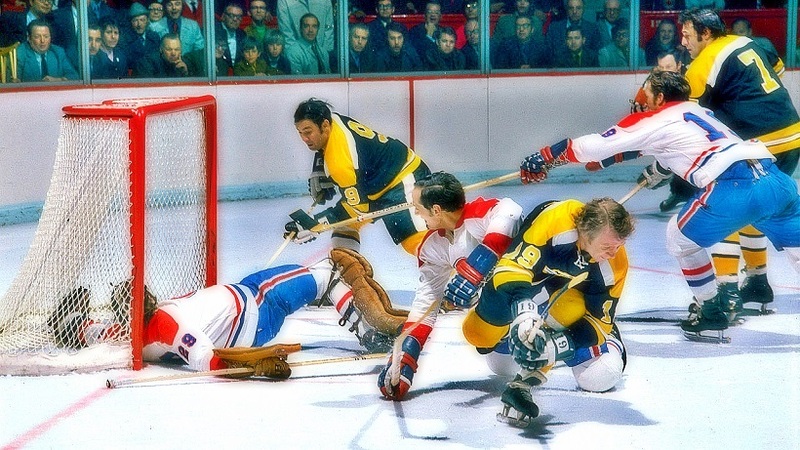 BOSTON at MONTREAL — 1970–71: ACTION IS HECTIC AROUND HABS GOALIE KEN DRYDEN (NOW 70) DURING THE OPENING ROUND OF THE 1971 STANLEY CUP PLAYOFFS AT THE MONTREAL FORUM. BRUIN FORWARDS JOHNNY BUCYK (No. 9 — NOW 83), JOHN McKENZIE (19) AND PHIL ESPOSITO (7) SWARM FOR A LOOSE PUCK. MONTREAL DEFENDERS (LEFT–TO–RIGHT) ARE JACQUES LAPERRIERE (NOW 76) AND TERRY HARPER (NOW 78). LED BY ROOKIE DRYDEN’S HEROICS, THE CANADIENS UPSET THE HEAVILY–FAVORED BRUINS IN SEVEN GAMES. 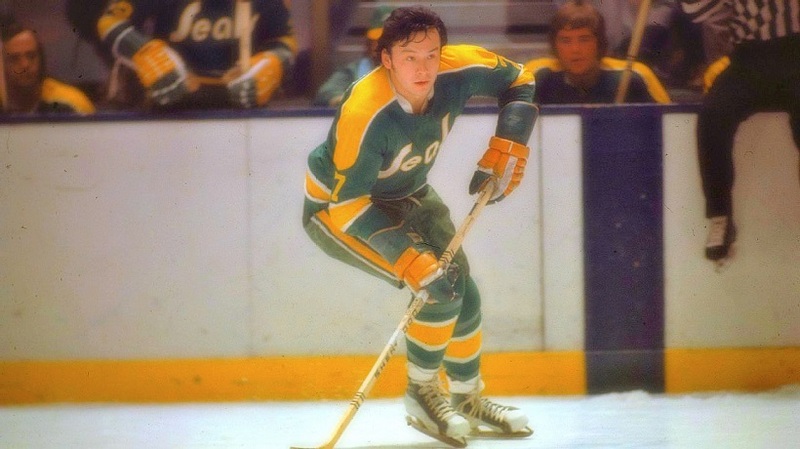 1972–73: YES, THE CALIFORNIA GOLDEN SEALS DID WEAR WHITE SKATES; HERE ON THE FEET OF A PLAYER THE CLUB SHOULD NOT HAVE TRADED — REGGIE LEACH (NOW 68), WHO LATER HAD SEASONS OF 61, 50 AND 45 GOALS FOR PHILADELPHIA. KANSAS CITY at TORONTO — 1974–75: AT MAPLE LEAF GARDENS, ON OCT 9, 1974, THE EXPANSION KANSAS CITY SCOUTS PLAYED THEIR FIRST NHL GAME AND WERE ROUTED, 6–2. HERE, TORONTO FORWARD ERROL THOMPSON (NOW 68) SKATES FOR A LOOSE PUCK IN FRONT OF K.C. GOALIE MICHEL PLASSE (d. Dec. 30, 2006) AND DEFENSEMAN BRENT HUGHES (NOW 75). THE SCOUTS WERE LATER THE COLORADO ROCKIES (1976–77 TO 1981–82) AND HAVE SINCE BEEN THE NEW JERSEY DEVILS. 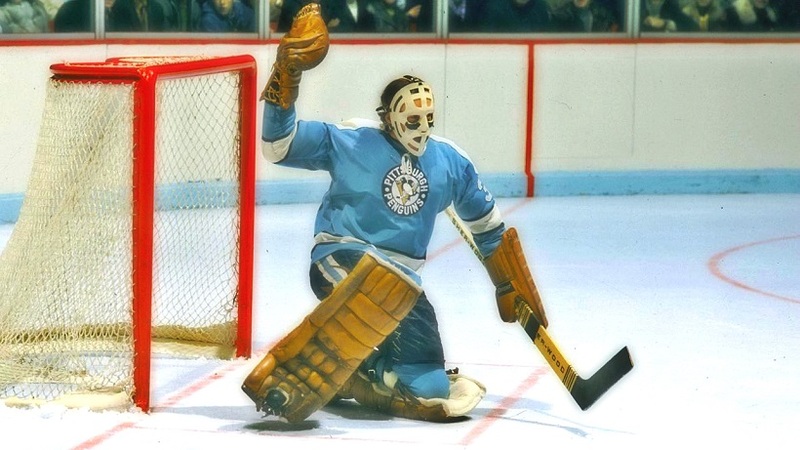 PITTSBURGH at MONTREAL — 1971–72: GOALIE LES BINKLEY (NOW 82) WAS A MEMBER OF THE EXPANSION PENGUINS IN 1967–68 AND THE CLUB’S NO. 1 GOALIE UNTIL HE JUMPED TO OTTAWA OF THE WORLD HOCKEY ASSOCIATION FOR THE 1972–73 SEASON. 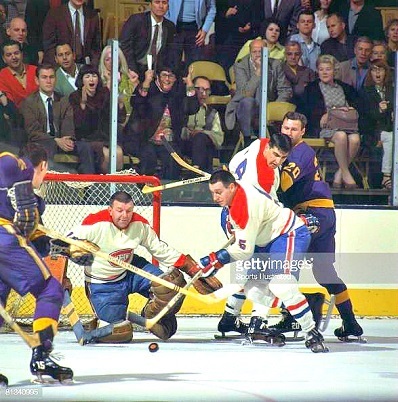 (LEFT) MONTREAL at LOS ANGELES — 1968–69: HABS GOALIE GUMP WORSLEY WATCHES PUCK WITH TEAMMATES GILLES TREMBLAY (No. 5 — d. Nov. 26, 2014) AND SERGE SAVARD (NOW 72). TYING UP SAVARD AT THE L.A. FORUM IS KINGS WINGER GORD LABOSSIERE (NOW 78). 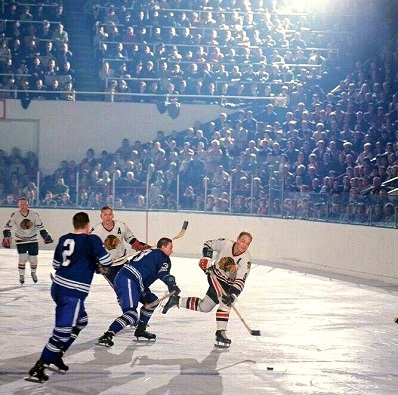 / (RIGHT) CHICAGO at TORONTO — 1966–67: WITH A STROBE–LIGHT FLASHING ON THE END–GLASS AT MAPLE LEAF GARDENS, BOBBY HULL FIRES A SLAP–SHOT PAST LEAF DEFENSEMEN MARCEL PRONOVOST (No. 3 — d. Apr. 26, 2015) AND LARRY HILLMAN (No. 2 — NOW 81). THIS FROM THE 1967 STANLEY CUP PLAYOFFS. 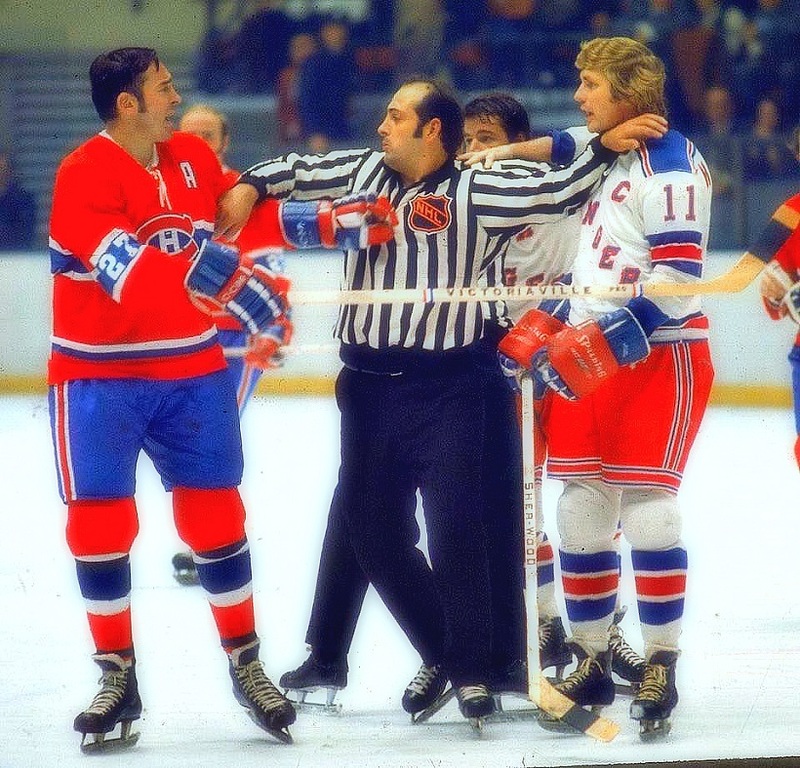 MONTREAL at NEW YORK — 1971–72: FRANK MAHOVLICH (NOW 80) OF THE CANADIENS HAS WORDS WITH RANGERS FORWARD VIC HADFIELD (NOW 77) AT MADISON SQUARE GARDEN. GETTING BETWEEN THE PLAYERS IS HALL–OF–FAME LINESMAN JOHN D’AMICO (d. May 29, 2005). GOALS WAS NETMINDER DON SIMMONS (d. Sep. 24, 2010). I like this idea but I’d rather trade Brown than Johnsson. I think Johnsson has a little more offensive upside than Brown. Also Brown will be in for his third contract in 2 years. He’s already at 2.1 million and would likely get an increase. Leafs will gave to watch every penny by then. If Dubas is correct and they can afford all the big guys then depth guys like Brown quickly become too expensive. I know potentially Johnsson could be in for a bigger third contract as well but I’d rather negotiate off a $700,000 base than a 2.1 million one. I metioned the Leafs getting Parayko a couple articles ago. I still think a top four of Rielly-Parayko, Dermott-Zaitsev is a pretty decent base to start from. Add in Borgman/Hainsey-Holl/Carrik and that’s not a bad top 8. Barring a move for a Karlsson type, the next best move is depth.